Popcorn is the ultimate in easy, versatile, and cheap snacking. 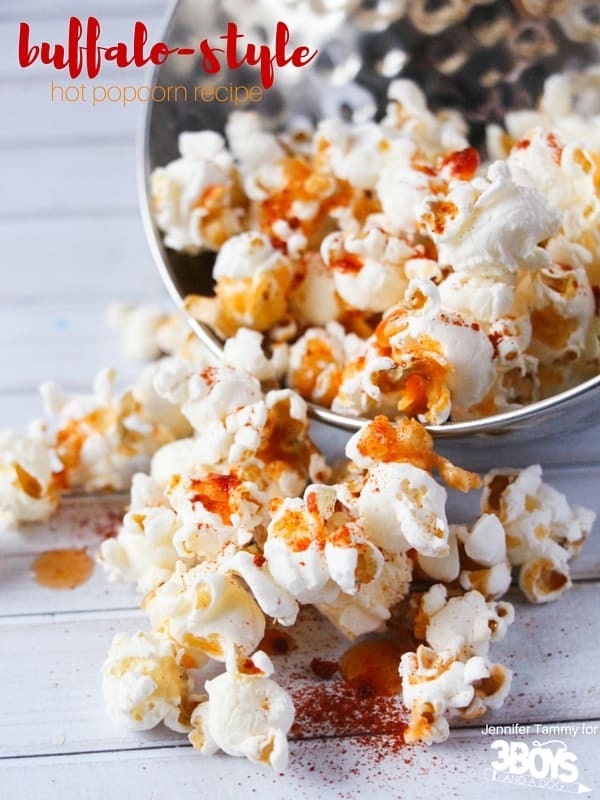 There are so many ways to season popcorn to get a completely different flavour or even texture! 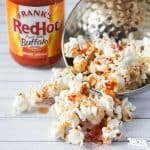 This Buffalo-style Hot Popcorn Recipe tastes like nachos but with less added fat and just as much crunch! I love buffalo chicken dip, but it’s not exactly the healthiest indulgence – or the kindest to my waistline before swimming season! 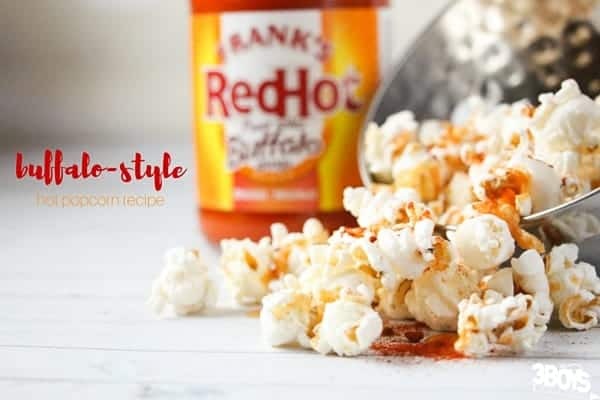 This Buffalo-style hot popcorn recipe keeps all of the flavour of my favourite dip – and my dad’s favourite bag of flavoured nachos – making it the perfect easy snack for enjoying on game night. It’s also a fun & affordable option for entertaining, skipping the expense of chicken or the work of putting together the dip. This buffalo-style hot popcorn recipe is best when prepared at least an hour before eating, but it still delicious if made and enjoyed right away. Make sure you taste and adjust the seasonings to your preference before serving to guarantee the perfect amount of spice and heat. Savoury, spicy, and with just a hint of sweet to take off the edge, this buffalo-style hot popcorn recipe can be adjusted to have more flavour than heat. My advice is to skip the cayenne if you’d prefer something a bit less hot but still want that buffalo flavour. I use an air popper to make my popcorn to remove the need for butter or oil, but ensure that you follow the directions with your popcorn maker when preparing your own. If making with microwave popcorn, opt for a plain variety. Place hot popcorn in a large bowl and drizzle buffalo-style sauce overtop. Immediately season with spices, taste, and adjust. Spread out on a baking sheet to dry, if you have time before serving. Approximately 1 hour. What’s your favourite healthy snack for entertaining? Be sure to also check out my Rainbow Salsa Recipe and 3 Meal Plans for Game Day.